Venerable Nirodha offers suggestions on getting less caught up in the disquieting intricacies of the sensory world, the craving for existence and the seductive pull of divisive politics. Simplicity of heart and mindfulness brings peace to both ourselves as well as our fellow human beings. Ajahn explains the importance of being relaxed, patient and enjoying yourself in meditation. Ajahn points out that being relaxed and patient is the opposite of the will of the mind, the doing activity of the mind and it is an aspect of letting go. You cannot change the world, it’s so hard to change the world, but you can certainly change your attitude towards it. And sometimes when you change your attitude, just the way you look it, the whole world changes with you – Ajahn Brahm. Ajahn Brahm talks about people who get discriminated against and rejected. Ajahn teaches us how to lessen our suffering in life by learning how to not stigmatise things. Ajahn points out that stigmatising parts of our lives makes it much, much worse, but learning to not judge and to look at events in our lives differently makes life much easier. This is Venerable Seri’s tenth rains since she went forth as a nun or Bhikkhuni. In this talk Venerable Seri shares with us the confidence she has cultivated on the spiritual path, on the Eightfold Path. Venerable encourages us to continue to practise and cultivate the confidence of a spiritual warrior, so that we can achieve liberation, freedom, Nirvana. Being kind and caring is very important for Buddhists. Ajahn Brahm stresses the importance of caring which brings much peace to our lives. Ajahn also explains how when making ethical decisions we should always look inside our heart to see what feels right. Ajahn Brahmali offers a practical approach to understanding the Buddha's teaching of non-self, and explains how to use this understanding in our Buddhist practice. How many times have you been unfairly blamed by others? How many times have you blamed others unfairly? There’s plenty of blame and judgment to go around – but if we listen carefully we can avoid finding fault and understand true intentions. Ajahn explains to us our compulsion to own everything. We see the news, read the newspaper and engage in discussion, we involve ourselves so much that we own it. We need to have the courage to say "this is not my business". We need to leave it all behind before we meditate. Ajahn then guided us through a 30 minute meditation well suited to beginners, encouriging us to free ourselves from the compulsion to "own it" with the small mantra of "this is none of my business". Ajahn then gave us a dharma talk on love and kindness followed by a Q&A. Venerable Hasapanna talks about how things going wrong in life is normal and it should not be a cause for suffering. Instead of fighting against it – we can let go and develop peace in the mind. Ajahn Sujato discusses the fundamental, essential teaching of the Buddha ‘The Noble Eightfold Path’. In this talk, Ajahn discusses not just what the Noble Eightfold Path comprises but also what is not in the Noble Eightfold Path such as rituals. Ajahn Brahm teaches the way to experience peace in meditation is by having a "this is good enough" attitude. Ajahn explains how when we make peace we experience peace. We apologise a few minutes of the end of this recording had to be removed due to the audio not working. Relax. Do we plan too much and then feel anxious quite often? 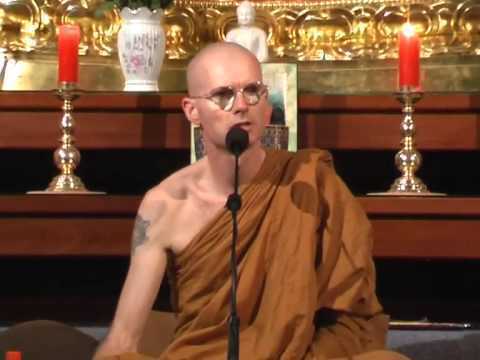 In this talk, Ajahn Brahm gives practical tips on how to relax and not be too uptight. Is devotion an important part of the path? Ajahn Brahmali looks at different religions perspectives on the role of devotion and discusses the role and uses of devotion in Buddhist practice. 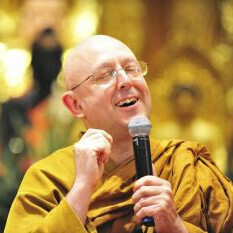 Ajahn Brahm picks up the quirky and unique topic of "Buddhism and holy water”. 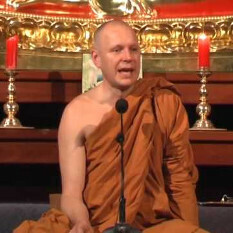 Ajahn talks about the great fun he has while conducting holy water blessings and the benefits of bringing joy, happiness and fun into your spiritual practise and the Buddhist traditions, rituals and ceremonies. Ajahn Sujato speaks about how the Sangha works. Ajahn describes how the Buddhist monastic community lives and functions and how the organisation’s principles and structure teaches us to apply the Dhamma in all kinds of practical ways. Responding to a request for advice on how to deal with a very big mistake. Ajahn Brahm reveals how he was trained by his teacher to deal with mistakes and Ajahn shares some of the funny mistakes he has seen, especially as a young western monk in Thailand. Ajahn Brahmali talked to us about happiness and comfort before and during our meditation. Meditation should not be a task, a duty, something we have to do. We need to be patient with ourselves and allow ourselves to become peaceful, comfortable and happy to be in that moment. A positive attitude [not forced], comfortable position and being happy will make for a good meditation. After our guided beginners meditation Ajahn used his wit, humor and experience to answer our questions. In answering our questions, Ajahn had us all on the edge of our seats for the rest of the evening. All to soon it was time to go. Fresh off a flight from California, Ajahn Brahm discusses the attitudes that lead to discrimination and their impact on people. Ajahn contemplates deeply on why people discriminate and why it's so wrong. Ajahn looks at what can be done to overcome discrimination such as learning to cooperate rather than compete and he encourages us to not discriminate against anybody e.g. gender, race, religion, mental and physical disabilities, vegetarians, sexual orientation, criminals and so on.